Learn the exciting skills of liftwork and use them with your favourite dance style. Easy step by step instructions to help you master them quickly. Learn some of the best R'n'R lifts with these excellent DVDs. 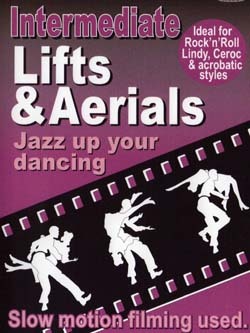 Enhance your Modern Jive, Ceroc, Lindy Hop, Jive, Jitterbug, Rock'n'Roll & Rockabilly dance styles. If you are a competitive dancer you will gain quite an edge with this DVD. The DVDs use slow motion techniques, have help screens for each lift, and now have new footage. Devised and presented by Australian Cabaret Champion Dennis Klumpp.